At the end of Arsenal’s bizarre 7-3 thrashing of Newcastle, hat-trick hero and man of the match made sure to salute every corner of the stadium. One wonders if he was saying goodbye to the Arsenal faithful ahead of the transfer window? If the fleet-footed attacker was to leave Arsenal, it would be another blow to Arsene Wenger’s hopes of creating a side capable of winning silverware, as the former Southampton man was superb against the Magpies on Saturday afternoon. 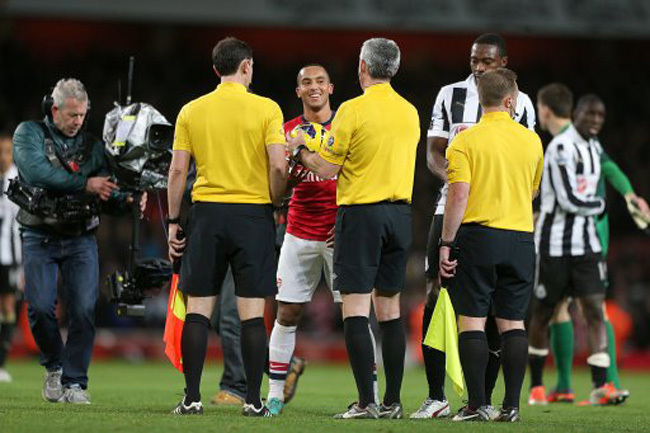 The first-half ended all square, after the visitors gave as good as they got against the Gunners. Walcott had opened the scoring on 20 minutes, courtesy of a superb, smooth finish a lá Thierry Henry, but a deflected Demba Ba free-kick gave the Magpies a deserved leveller on half-time. In the second-half, the Gunners pushed forward with increased urgency and scored courtesy of a fine strike from Alex Oxlade Chamberlain. However, some trademark dismal defending from the Gunners (and Kieran Gibbs in particular) let the visitors back into the game, with Sylvain Marveaux scoring at the far post to level the scores. After Lukas Podolski had then put the north Londoners in front, the home side were again guilty of more bad defending, with Ba firing home from close-range to peg back the Gunners for the third time in the contest. With the scores at 3-3, Gooners were fearing the worst, but then the Magpies seemed to wilt and the Gunners, energised by the introduction of Olivier Giroud, went in for the kill. Walcott finished calmly from close-range before a fine Giroud Brace put the game out of sight (the Frenchman almost got his hat-trick . Yet there was still time for Walcott to bag his hat-trick, courtesy of a superb mazy run, which saw him tripped before getting to his feet and deftly chipping Tim Krul. Sign him up, Wenger, or the Arsenal faithful may never forgive you! Arsenal go fifth while the Magpies, despite bagging six away goals in two games, are now just three points clear of danger. @Jason…..calm down son! This is a light hearted football website not and in-depth David Attenborough report!!! Wowzers! All in all a great game for the neutrals! @ Jason “Gave as good as they got” Arsenal weren’t good either in the first half either.